The Cockayne Farmstead, located in Glen Dale, West Virginia, is a nearly two-acre farmstead comprised of two c. 1850’s houses – a large two-story Farmhouse and a small adjacent Tenant House; several small outbuildings; and a large earthen Adena Indian burial mound (c. 1000BC to 1AD). Originally settled by Samuel A. Cockayne in 1798, the farmstead acquired land up to 600 total acres at its peak and drew worldwide attention as future Cockayne generations produced outstanding quality wool from Merino sheep raised on the farmstead property. The wool won awards at the International Exhibition of the United States Centennial Commission in 1876, as well as at the International Exhibition in Paris in 1878. Samuel A. J. Cockayne was the last family descendant to live on the property, mostly as a recluse, until his death in 2001 when the property and its contents were bequeathed to the City of Glen Dale. The Farmhouse is listed on the National Register of Historic Places and houses approximately 2,000 artifacts in its collections, including furniture, decorative arts, paintings, prints, frame photographs, tools, textiles, and other household items used and created by generations of the Cockayne family over the course of their relative wealth and success. There are also approximately 10,000 archival documents, books, magazines, and photographs. The property is now overseen by the Marshall County Historical Society’s standing Cockayne Farmstead Preservation Project Committee. To support the efforts of the Cockayne Farmstead Preservation Project, please visit their website here. The 2014 treatment of this artifact was the result of a Conservation Assessment Program (CAP) grant provided to the Cockayne Farmstead Preservation Project through Heritage Preservation. The on-site assessment survey was performed by John Hartmann in 2012 in order to conduct a historic preservation analysis report identifying conservation/preservation issues and solutions for the property’s Farmhouse and Tenant House. 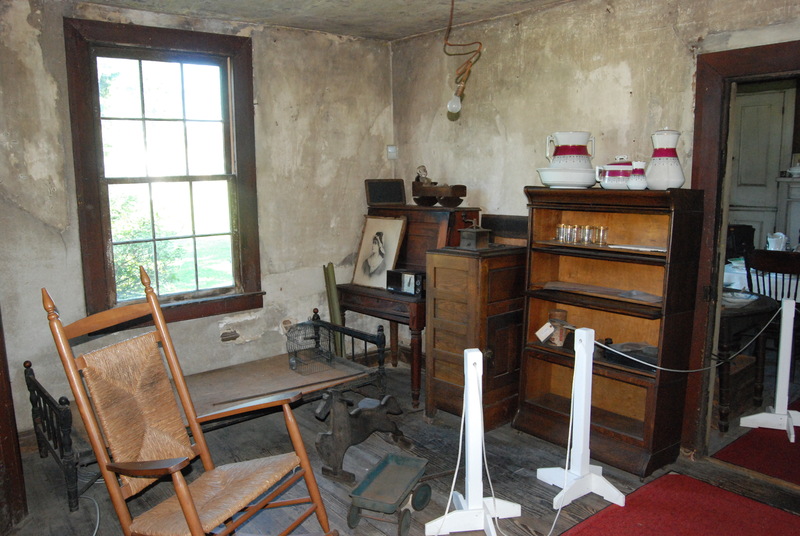 The specific purpose of this initial general conservation survey was to review the collections, buildings, environment, storage, policies, security, safety issues, and artifact exhibits at the Cockayne Farmstead with the intention of providing professional feedback and present a prioritized outline for upgrades, continued growth, or the correction of critical problems. The Farmstead staff has shown great dedication to following through on many of Hartmann Conservation’s preservation recommendations as they continue to make progress and property upgrades. 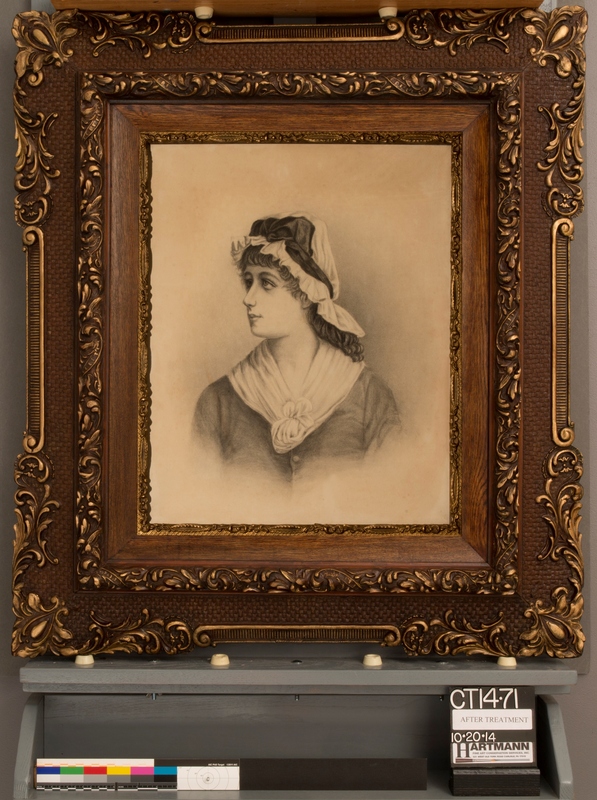 This frame accompanied a charcoal portrait of a young woman in a bonnet, likely one of the Cockayne family members, on machine-made paper. The original artist was unknown, but may have been one of the Cockayne descendants. 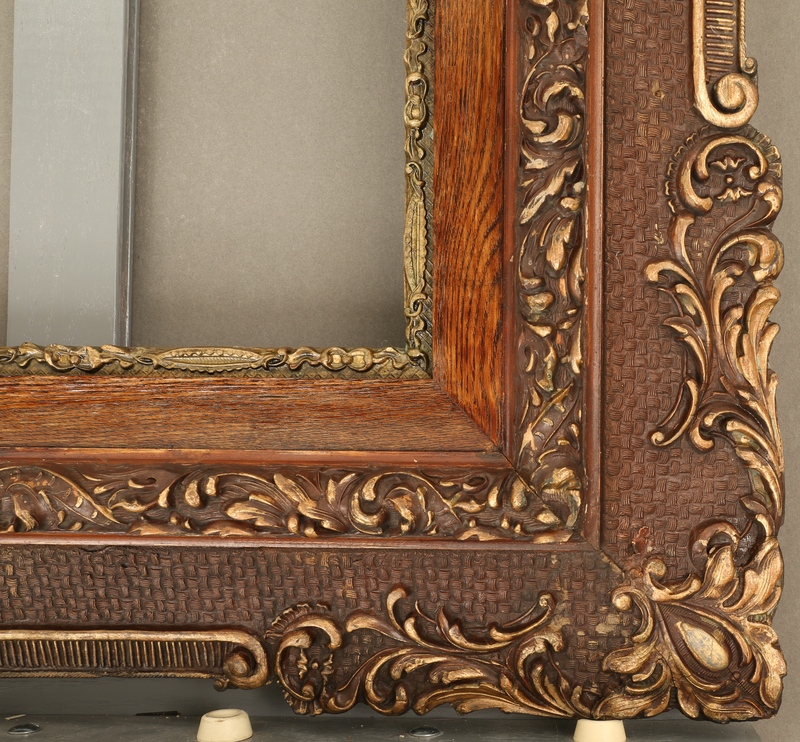 The frame’s origins are also largely unknown, but it appeared to have been original to the piece and dated to within the last two decades of the 19th century. It was primarily painted with a red/brown stain with obscured gold highlights of water gilding. 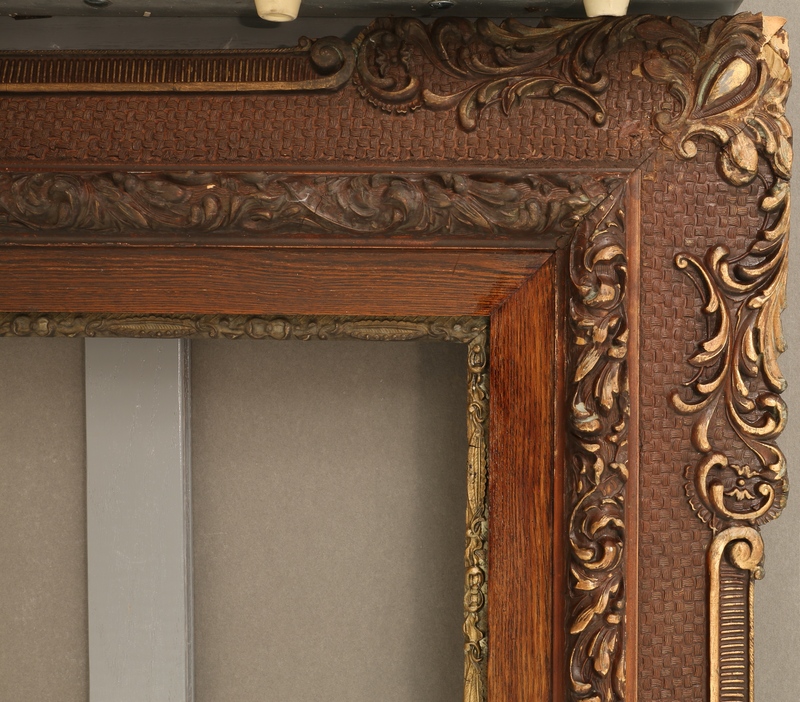 An inner decorative frame liner was painted with metallic paint and most likely added when the portrait was original framed. The 2″ wide wooden cove-molded inner liner of the frame was both stained and coated with shellac. 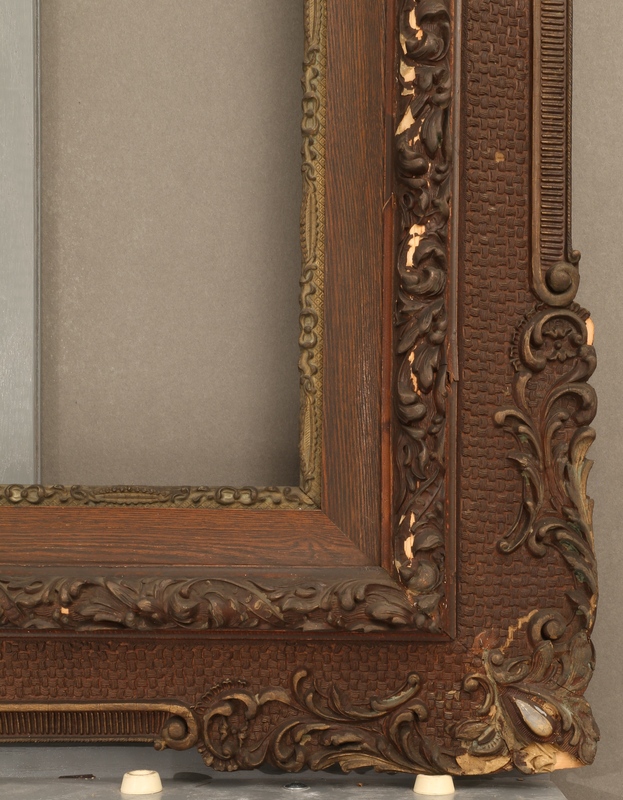 All surfaces of the frame were covered with a very fine black soot – a result of the Farmstead’s coal fireplaces – and were so dirty that the gilded highlights were almost completely undiscernable. Ornamentation losses, areas of flaking and lifting gesso, and surface gouges were present throughout the piece. 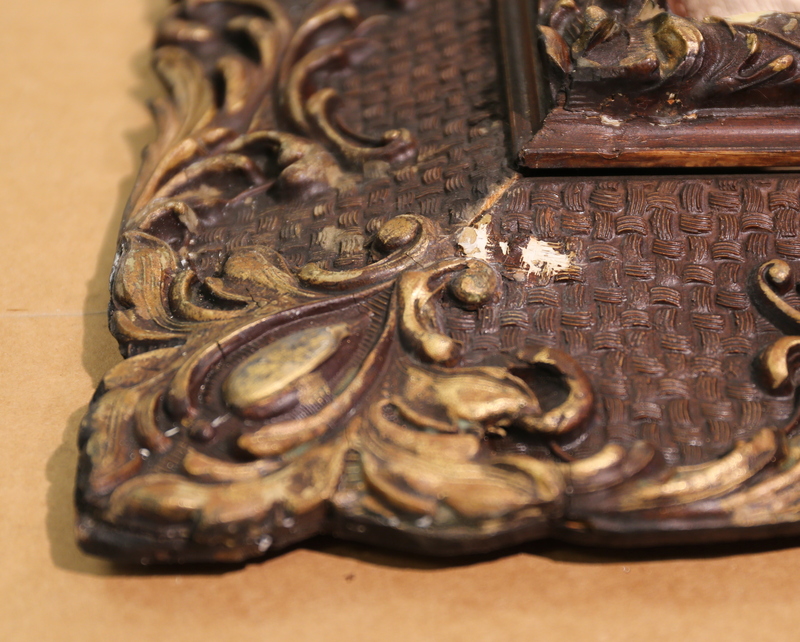 All sides, front, and back of the frame were surface cleaned with a dilute detergent and deionized water using a soft stencil brush, followed by a mild solvent rinse. Augmented cleaning of the surface was done as necessary using an organic solvent mixture to remove more deeply embedded soot grime, and surface dirt from both the painted surfaces and gilded highlights. The inner metallic painted decorative liner was removed to facilitate full cleaning. Denatured alcohol was used to clean the shellac finish from the surface of the 2″ wooden liner. 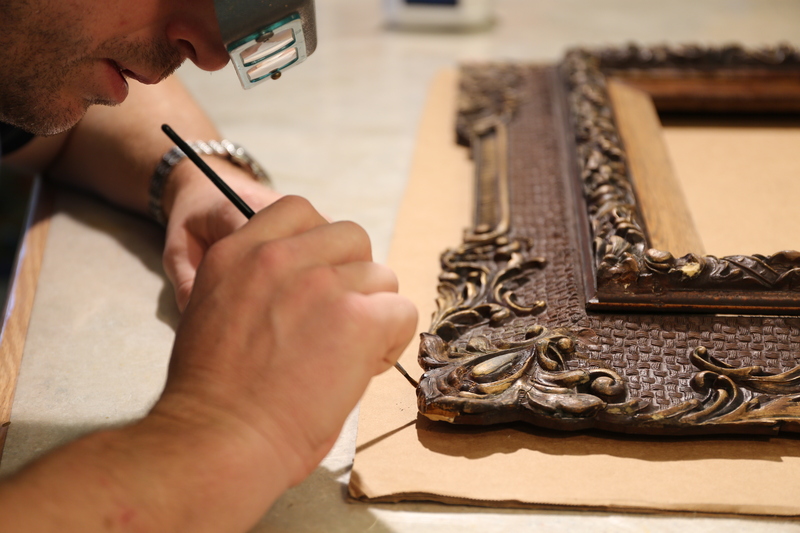 After completed cleaning, a spray coating of conservation-grade varnish was applied to the frame. 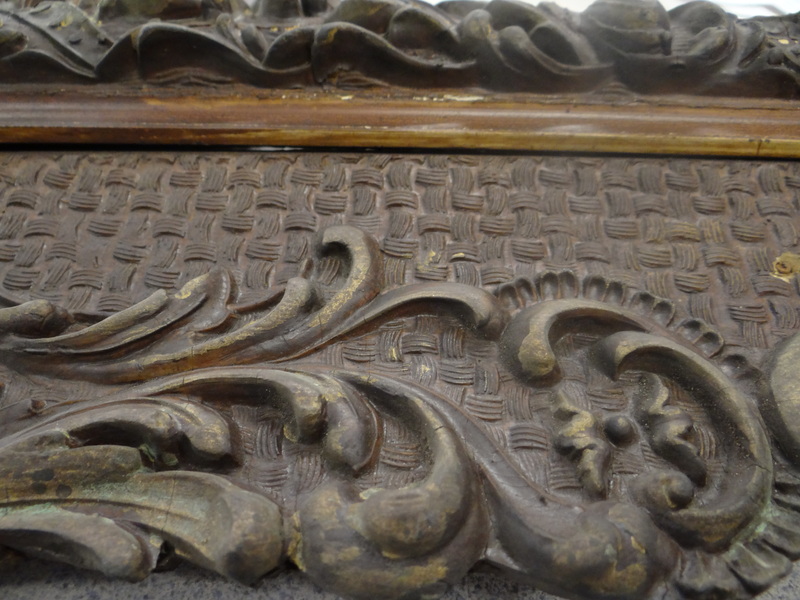 Any missing ornamentation was cast with a two-part carvable epoxy resin using the one existing intact corner element to make a mold for repair of the remaining three damaged corners. Replacement casts were also made for any missing edge elements. 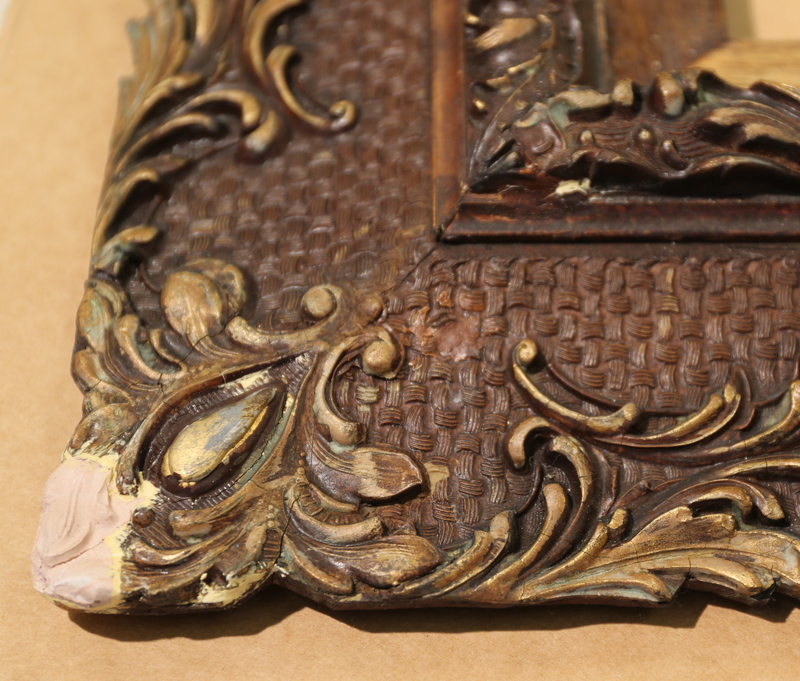 The new castings were attached to the frame using conservation-grade polyvinyl acetate woodworker’s adhesive and replacement elements were inpainted, toned, or gilded to match surrounding areas using mica powders mixed in varnish, conservation-grade paints, and gold leaf. A pigmented wax finish was applied to the inner cove molding. The charcoal drawing was then reframed with an ultraviolet filtering acrylic sheeting and 4-ply acid-free matboard. 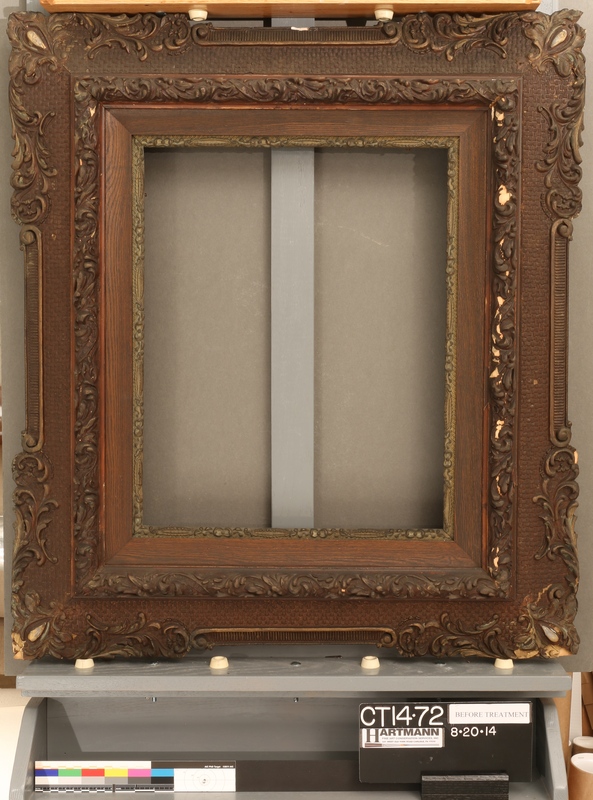 The artifact was then properly reframed in the conservation frame with a stable corrugated plasting backing board, brass mending plates and hardware, and a braided picture wire.